You may have heard it said–and if you shop for Bibles here at the bookstore, you have heard it said here–that a good study edition of the Bible is an incredible asset, a fabulous tool, and a great gift (to get or give.) We think that the Life Application Study Bible is really, really useful. We are glad that it comes in a variety of bindings and sizes and translations such as the New Revised Standard Version (NRSV), The New Living Translation (NLT), The New International Version (NIV), the New American Standard (NAS), the KJV and the NKJV. Most days I say it is my favorite study edition. The notes are helpful, the introductions to each book of the Bible excellent and truly interesting, the time-lines the clearest of any study Bible. Character studies and explanations of the ordinary daily application of Biblical themes are user-friendly and inspiring, almost always keeping a fabulous balanced between factual information and inspiring suggestions on what it all means and what to do about it. It always reminds you why it matters–hence, the “life application” title. (I jokingly call it the “So What?” study Bible. Great stuff, especially for those not used to digging in, looking things up, or who for those who may wonder what in the world that could possibly mean. published by Zondervan; evangelical, interesting, often showing arguments for several interpretations and explaining various options of meaning, it has often been called the best study Bible available and it seems to be the best selling of any serious study edition. I know some of our mainline friends are skeptical of its conservative bias, but we really do recommend it. 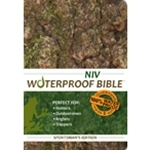 You may not love the NIV, but the notes are very, very helpful, the concordance and maps superb, the various notes outstanding. It comes in small, medium, large, and really large, and an array of colors, duo-tones, with all kinds of fashionable designs and clever features. Gone are the days of white vinyl and silly little zippers. The array of options is mind-boggling; I am so grateful that such a serious, thoughtful, solid bit of Bible scholarship has been made commercially viable and popularly interesting. You can give one to nearly anybody and it feels right. For those that like the very conservative rendering of the recent and quite elegant English Standard Version (which rather reminds me of the old RSV) their new study bible, done by Crossway, of course, is called The ESV Study Bible, is second to none. As we described it when it first came out, t is loaded with tons of very excellent notes, solid information, and is the most finely-made, sturdy and enduring hand-crafted Bible for ordinary use on the market. Even those that don’t like the mildly Reformed bias will be impressed with the diligence, care, and insight with which it has been produced. Magisterial, thick, and truly an amazing study Bible. In the NRSV there is the slightly left-of-center, but well done HarperCollins Study Bible published under some affiliation the Society of Biblical Literature. It may be the best for study from a critical perspective, scholarly and studious, although the maps aren’t the best, and the type is rather smallish. Still, it is important. For our United Methodist friends, at least, there is a really handsome duo tone study edition called The Wesley Study Bible published naturally by Abingdon. Wonderful scholars who truly love the church served as senior editors—Joel Green (now of Fuller) and Bishop William Willimon, so it has a widely accepted, centrist,and very useful approach. You can imagine the sweet blend of rigorous scholarship and piety and the routine call to action and service. somewhat in relationship to the remarkable multi-volumed, hefty Interpreters Commentary set. (That is the one that has the entire NIV and NRSV text. N.T. Wright, for instance, does Romans.) I wish there were more editions and bindings and spiffy covers and better marketing (like the evangelical publishing houses like Zondervan and Crossway.) It deserves to be better known. Of course it is very scholarly and spends much time in what some might find to be a bit arcane detail. Given these new, liberally-oriented, mainline NRSV study editions, why anyone would want to use the meager and eccentric New Oxford Annotated is beyond me. For years it was the only study edition in the NRSV but it is now so surpassed by these others that it’s puny and biased scholastic notes can happily be ignored. I hate to pick a fight with my ecumenical pals, but I’ve seen it erode Biblical authority in some who have used it and I am annoyed by how few serious notes it has on urgent questions or complicated passages. And when it says “scholars agree” hold your nose because you know your about to get what should rather be said “some scholars believe…” Oh yeah, don’t get me started. notes were done mostly by Richard Foster, Eugene Peterson, Dallas Willard, and Walter Brueggemann. I know there are websites out there that say that these fellows are unfaithful and weird. Let me just say that is hogwash. 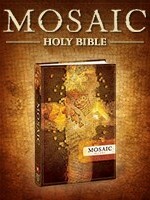 This is a very useful resource, a fine devotional guide, powerful and spiritually attentive. If you don’t have a NRSV and don’t need a detailed study Bible, this is a very nice option. Here are a few we wanted to highlight as great, but lesser known, new editions. They’d make a great gift for the Bible lover who “has everything.” Bet they don’t have the Water Proof Bible, now do they? Read on! 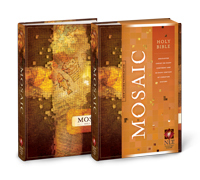 The Mosaic Bible New Living Translation (Tyndale) $29.99 (hardcover) $49.99 (antique brown imitation leather) I am drawn to the look and feel of a book, and holding this Bible with it’s rich orange hints over dark brown, I’m immediately drawn to it. Both the hardback and the smooth faux leather feel great. It has pages and pages of lovely celtic cross graphics, in fine ink, highlighted with red (like a prayer book would, but even nicer than most.) This is classy to see, and the first third is a daily devotional, with prayers, poems, short readings, quotes from folks as diverse as medieval mystics to Wendell Berry to Martin Luther. Perhaps the best feature is the full color contemporary art that accompanies this–nicely produced on glossy paper. The artists are from all over the world and while it is usually quite evident how the art piece illumines the devotional reading and Bible portion, they usually are fairly modern. There are a few classics, and a couple of standard icons. The Oswald Chambers Devotional Bible English Standard Version (Crossway) $34.99 (hardcover) $54.99 (Navy/Tan imitation leather) This ESV edition has 365 readings from the extraordinary young Christian writer whose books were all done posthumously by his beloved wife. This is in double-column paragraph format, has a 12,000 entry concordance, and is (like all the Crossway ESV Bibles) is smyth-sewn and very durable. Visit the ESV website at www.esn.org/freesoftware to check out the translation and some free o-linestuff. This is a fabulous way to become familiar with this serious, very accurate, and highly literate rendering of sacred Scripture and a usable way to dip into the best of this great early 20th century preacher. The Transformation Study Bible New Living Translation (Tyndale) $39.99 (hardcover) $69.99 (dark brown Milano) I generally dissuade customers from getting study editions done by one guy. I don’t care who it is, nobody can tell you everything about everything, so we generally don’t promote Dakes or Scofield or any other Bible with a single person’s name on it. Yet, we will make an exception (with the reminder that the notes are just one person’s interpretation, and an inter-denominational, team-based approach like the ones listed above are better for deeper study.) I make an exception here because I have found many folks, especially those that are not really well-schooled, have come alive to reading commentaries by using the 50-volume, paperback Be series of evangelical Bible preacher and pastor, the solid and delightful Dr. Warren Wiersbe. Here, we have Dr. Ws reflections on every page of the Bible, drawn from his beloved, clear-headed commentaries. He has here notes to motivate you to experience real-life transformation by highlighting key character issues in Scripture. There are overviews and introductions in conversational style. Wiersbe’s study notes clarify key passages by explaining what they mean in down to earth plain-spoken language. He is a teacher’s teacher and I’m happy to commend this genius idea of putting his stuff alongside the Biblical text as a study edition of the Bible. Nice, especially for beginners. The Stewardship Study Bible New International Version (Zondervan) $39.99 (hardback) $69.99 (black/caramel imitation leather) I’ll tell a true little story. My sales rep for this fine company was surprised when I turned up by nose at this as he presented to us for our consideration. (Well, he’s usually thrown a curve ball or two when he visits here, with us taking what nobody else approves of we complain about some of their cheesy big projects.) I told him I was tired of these niche marketed themed devotional Bibles, with Bibles for mothers and leaders and business people and environmentalists (okay, I liked that), ones about prayer and for seekers and maybe left-handed mechanics…boy, was I ever wrong. ichael Novak and Jim Wallis, John Calvin and William Penn? Truly, this is an amazing resource, designed together by the Stewardship Council and the Acton Institute. (There is even a very classy, five part DVD [$19.95 book; $7.99 study guide] that has been made, teaching whole-life stewardship principles, produced by Acton, explaining our duties to manage well our resources and live into the great adventure of serving God by taking care of the creation, neighbor, and using our talents, time and treasures for others.) In these hard economic times, folks not only need the solace and vision of God’s grace as found in Holy Scripture, but we need assistance and guides for living it out, working out the implications of doctrines like stewardship. I think reading the Bible with these helpers offering tid-bits along the way could be life-changing. Sorry, sales rep Mike, that I doubted you. This is a great, great product. (By the way, like many faithful publishers these days, this is manufactored as “Certified Carbon Neutral” and printed on FSC Certified paper with 10% post consumer waste. How’s that for trying to get it right. Kudos and thanks! 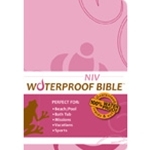 NIV Waterproof Bible (Bardin & Marcee) $39.95 (blue, pink or sportsman’s camo) Here is another backstory. A few years ago we met up with some cool guys that did outdoorsy stuff, worked in Christian camping, did wilderness trips, were involved in experiential education kind of adventure trips. They got the rights to a Bible translation that wasn’t particularly popular and printed up several individual books of the Bible on honest-to-goodness topographic map paper. (They had the world’s leading topo map company do it, actually.) The plan was to fold up these indestructible map-like gospels and head to the woods. They really wouldn’t tear and they were thoroughly waterproof. We thought we were pretty cool to stock ’em. Thing is, who really wanted a rather pricey topo-map Mark in the NAS? Lastly–from one unusual extreme to another—I hope you recall how we raved about the new, high-powered electonic Bible, Glo. (Zondervan; $79.99) It’s the full NIV Study Bible with thousands of photos, holy land video footage, top-of-the-line computer generated graphics, amazing Bible handbook stuff—pictures of ancient artifacts, lots of excellent maps, movable journal spaces, lots of historic art pieces, tons of commentary, literal lectures and such. It’s truly amazing, but (as we said in our initial announcement) it takes some serious computer power, and it is only for PC (not Mac, yet.) Digital cheers to Zondervan for producing this state-of-the-art computer software, softward more exciting than any Bible stuff you’ve seen before. A great post. The Life App NLT tends to be one of my favorites and was the first bible I read the whole way through. Its still one of my faves. The ESV Study bible, is the one I tried to read through this year. I only made it about halfway (all NT, less than half of the OT). While the overviews are good, I found its footnote commentary to be extraordinarily redundant. The verse would be “Jesus went to Jerusalem.” and the commentary would be like “This is the part where Jesus left his town and went to Jerusalem.” I found myself disregarding the commentary altogether. As for Theresa and myself, Grove City College used the NIV Study Bible for Old Testament and New Testament classes. As such we referred to the NIV Study Bible for several years. Personally, I’ve enjoyed referring to the Word in Life Study Bible, but have not made it regular practice. As time permits, I refer to the New Bible Commentary, but have not gotten into the practice of taking it beyond the office. Maybe I should purchase a hand held device and download these resources. When our twins turned 7 we gave them NIrV Kids’ Devotional Bibles. They enjoy referring to them during Sunday morning worship, but they are not regular practice. With the range of ages among our kids (twins who are 9, 4 year old, 1.5 year old), family devotions have been based around “My First Message,” “the Jesus Storybook Bible,” “Bible World” (on break during Advent), and “The Jesse Tree” (this year’s Advent). Good post. I like the 2nd edition of the NOAB. I found the 3rd to lack Metzger’s good editorial eye. There is a 4th edition coming out in 2010. But I don’t use the 3rd & might not buy the 4th. I have a slew of study bibles, but the one I use most is the NIV Study Bible. Actually, I use the most recent one that has a few more notes in it. In addition to the NOAB I also check out the New Interpreter’s, Wesley, & NLT Study Bible. I think the NLT is great for reading. It is also good as a translation to check when studying. My lovely wife for my birthday got me the ESV study bible and i have loved it ever since. The online version you are permitted to have as a result of purchasing the hard copy is incredible as well! Everything that is in the Bible is available for view by signing up with the password you are given when you purchase the Bible. It’s very handy when you have extra time or you are at a computer and someone asks you a Bible question (welcome to the life of a campus minister, right?). And you can click on “Listen” and hear the word spoken as well online. Very impressive. I am completely impressed with the article I have just read. I wish the author of https://www.heartsandmindsbooks.com can continue to provide so much worthwhile information and unforgettable experience to https://www.heartsandmindsbooks.com readers. There is not much to state except the following universal truth: And, nobody gets out of this alive. I will be back.